At 80, former Muddy Waters pianist Pinetop Perkins is enjoying his greatest personal success. His latest solo album, "On Top," joins three others released within the last five years: 1988's "After Hours" on Blind Pig Records, "Pinetop's Boogie Woogie" for Antone's in 1990, and 1992's "Boogie Woogie King" on Evidence. 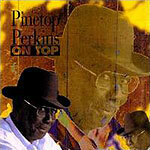 Comparing his new release to "Boogie Woogie King," which was actually recorded in 1976, shows that Perkins has granted no quarter to age. His piano playing today is as energetic, as imaginative and as driving as when he helped anchor the Muddy Waters Band a quarter-century ago. And if his vocals aren't quite as strong  well, it probably bears pointing out that Perkins never earned his rep as a singer. On the new album, Perkins is again teamed with harpist Jerry Portnoy, a fellow Muddy Waters alum. Their musical empathy lends the session a seeming comfort zone that allows Perkins to really cut loose. The material is a mixture of covers  Eddie "Cleanhead" Vinson's "Kidney Stew," Muddy's "Little Girl," Elmore James' "Look on Yonder Wall"  and originals, all of which Perkins and band churn out in inimitable Chicago style. This is an excellent album, with top-notch recording quality and world-class musicians.